The term “complex machined parts” can sound both daunting and expensive to anyone seeking to outfit, maintain, or upgrade their existing machinery. A mass-produced, quick-fix option can seem like less of a risk at the outset, but in reality, a lower-quality part can jeopardize the entire piece of machinery. With parts machining, you get what you pay for, but some “solutions” can end up being more costly than you bargained for. Our engineers, who have a background in machining, will be able to recommend the best methods and machining processes for your particular part, saving you the cost of contracting with an engineer on top of a parts manufacturer. 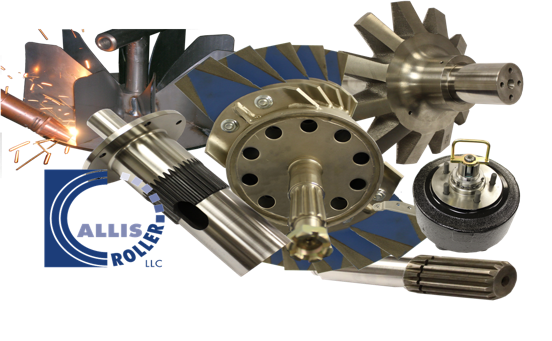 At Allis Roller, our team has decades of engineering expertise, enabling us to handle the parts production process from start to finish. We’ll even collaborate alongside OEM engineers during the design phase for optimal manufacturing. In-house engineering ability can reduce the likelihood of error or miscommunication between engineers and machinists, resulting in a more cohesive solution. Lower priced machined parts are less costly simply because you generally have less of an assurance of precision, quality control, and longevity. Not every application requires a highly custom solution, but for those that do, complex machined parts done right can make all the difference. Now what kinds of complex machined parts can you expect to find? As you can see, a skilled machinist and parts engineer can make several different kinds of custom modifications to seemingly simple parts. Those enhancements and attention to detail can make all the difference when the application requires a complex machined parts design. For more information on complex machined parts, and the kinds of additional processes Allis Roller is capable of, connect with one of our machining experts via the Contact page.